It’s long since past the time when you needed to clarify whether or not you were referring to freeze-dried bricks of noodles resembling '90s era-Justin Timberlake when discussing ramen. 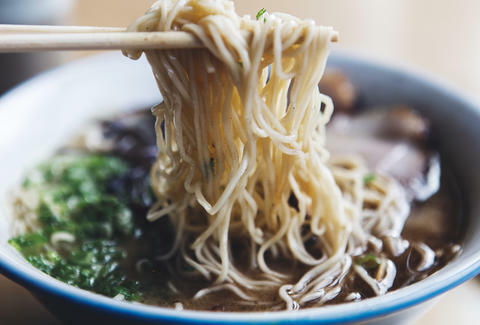 Ramen has passed out of novelty and entered the daily culinary vernacular of DC’s dining public, but hasn’t quite reached the saturation of a city like New York. To date, you could count the ramen shops of note in DC on two hands. With that in mind, let's take stock (!) of the major players in the local ramen scene, and talk about where things are and where they're going (including an exciting yet-to-open spot you'll surely want to know about). For a long time, Ren’s Ramen was the only place to get a reliably quality bowl of ramen in the DC area. Ren’s served a traditional Sapporo-style ramen, but was too far off the Metro grid to be that accessible for all but the most devout Washingtonians. 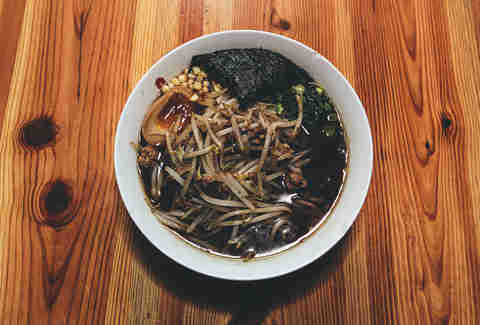 Then came Erik Bruner-Yang’s Toki Underground in 2011, which lit a match under DC’s love affair with the noodle soup. "I call them the pioneer," says Sushi Taro owner Jin Yamazaki, "even though technically, Toki isn’t the first ramen shop." Funny enough, Bruner-Yang doesn’t even classify his shop as an actual ramen-ya. "We’re definitely not Japanese," he admits, "But we understand the rules of tradition." More closely aligned with his experience with ramen shops in Taiwan, Bruner-Yang’s bowls have evolved from attempts at making pure tonkotsu broths every night in Toki’s opening months, to a more efficient triple stock found in the soups today. 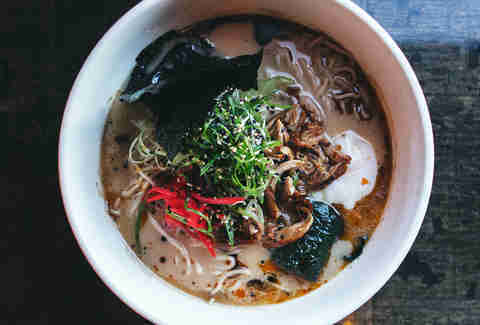 2013 saw the opening of Daikaya, whose success has cemented the ramen tradition in DC’s dining culture. 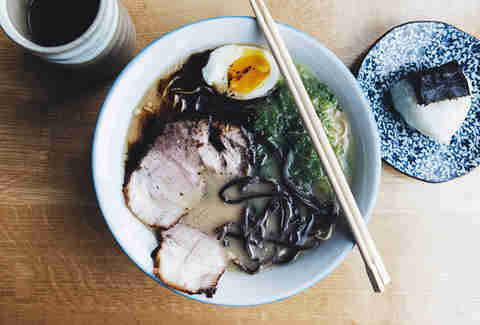 Under their ramen master in Sapporo's tutelage, co-owner Daisuke Utagawa and Executive Chef Katsuya Fukushima have built Daikaya into a ramen shop that slings fiercely authentic Sapporo-style bowls that have been embraced by the ever-growing crowds waiting outside its doors. 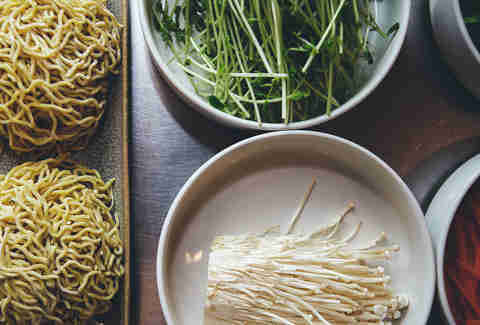 Yet despite the strides ramen has made in DC, there are still only a handful of shops -- but those that have thrived have done so because they understand that ramen, like most things in Japan, is about dedication, reverence, and meticulous attention to detail. To hear Utagawa hold forth on the history and evolution of ramen, it’s easy to see why Daikaya gets it right. From the 1600s shogunate that granted asylum to a Chinese emissary that made him a noodle soup (which some say was the precursor to ramen) to Rai Rai Ken in 1910, and Aji no Sanpei in the 1960s (the origins of wholly Japanese ramen and Sapporo-style ramen respectively), Utagawa speaks of these events as if they were scripture. But fast forward to the present day, and the question of "what is ramen?" becomes much more about the science than historic conjecture. "If you ask ramen chefs in Japan," Utagawa says, "they will say that the definition of ramen is this thing that has four components: stock, tare, alkali noodles, and flavored oil." It’s the variations of these four elements that have given rise to over 30 different regional variations in Japan and a healthy variety here in DC. Toki Underground is unique in that, as mentioned above, it wouldn’t technically qualify as Japanese ramen. In the three years of the shop's life, Bruner-Yang’s efforts have been better defined by his efforts to serve the massive demand for his soup without sacrificing quality, than a religious dedication to a traditional standard. 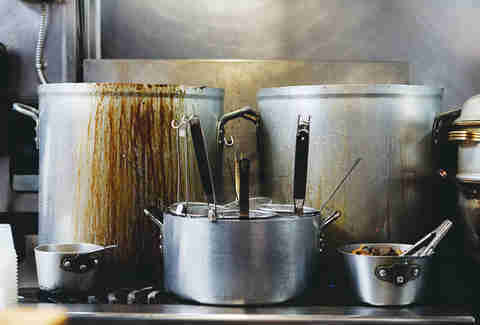 "“In the first month I made all the soup everyday before we opened -- a pure pork stock then mixed with dashi -- and that was the amount we would serve everyday and we would always run out. It was unsustainable." Today, Toki’s "Classic" ramen consists of a pork stock that’s been mixed with chicken stock, a plain flour noodle bought locally, chili & burnt garlic oils, and toppings. This serves as the basis for the four other bowls, including the Taipei Curry Chicken and Kimchi ramens. 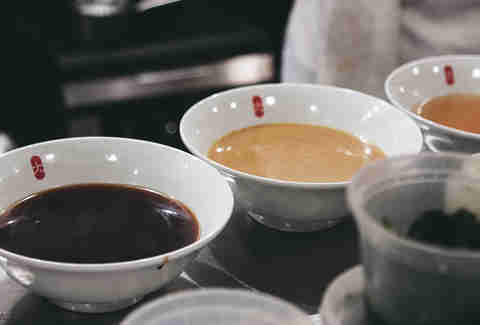 They have the richness that is characteristic of a tonkotsu broth, but with myriad other flavors piled on top. "We don’t go for balance," Bruner-Yang explains energetically, "Toki Underground is a punch to the face. The first 15 bites you take are just straight flavor." Toki Underground’s most appropriate foil would be Sushi Taro. While Bruner-Yang has tinkered with the tonkotsu recipe to make it uniquely his, Sushi Taro serves an unadulterated and authentic expression of the Hakata-style ramen. Something of a unicorn in the world of DC ramen (as it’s only served for lunch once a month), Sushi Taro’s tonkotsu is about as authentic as it comes, albeit difficult to actually obtain. Executive Chef Masaya Kitayama’s tonkotsu is a pure tonkotsu broth with a custom thin straight noodle from Sun Noodles, topped with the orthodox chasu, ni tamago, and mayu (chili garlic oil). The pork broth is light, creamy, and cleaner than you’d ever expect a soup made from boiled pork bones and fat to be. 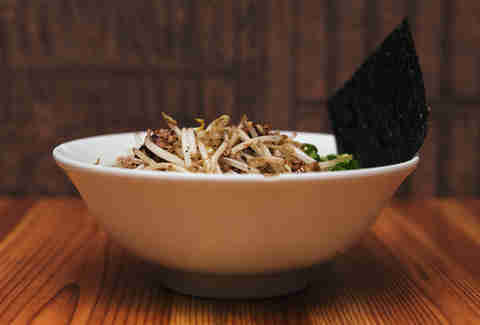 "For the Japanese, toppings are a secondary thing," Yamazaki says while explaining the minimalist nature of the bowl, "ramen is all about soup and noodle -- everything else is just to be fun." The aforementioned Daikaya is similar to the far-flung Ren’s Ramen (in the suburban purgatory of Wheaton, MD) in that both specialize in Sapporo-style ramen from the Hokkaido region of northern Japan. "If you wanted to define Sapporo ramen," says Utagawa, "I would say it has chintan stock; curly, well-aged thick noodles; shio, shoyu, or miso tare; and wok cooking as part of the process." The key things differentiating a bowl at Daikaya from shops like Toki Underground are the stock and noodle. Daikaya’s Sapporo ramen utilizes a chintan stock, which is clear, while places like Toki Underground and Sushi Taro utilize a paitan stock, which is emulsified and opaque. "The first and last sip of a chintan stock taste different and shows the delicacy of the tare more," Utagawa tells me as he professes his preference for Sapporo ramen. "But I do like a well made rich paitan ramen, it's just due to the richness of the paitan that I can eat chintan ramen more." Daikaya’s noodles, which are imported from Nishiyama Noodles, are also aged and curly to complement the chintan soup better. "Aged noodles that are curly pair better with chintan stock because you can taste the difference between the noodle and the soup," Utagawa continues, "while unaged noodles are more porous and match better with thicker paitan stocks -- you don’t taste the noodle as much." 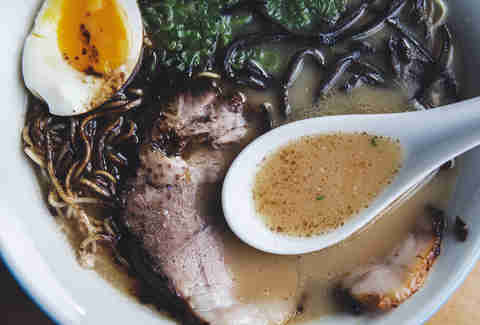 As the fascination with ramen continues unabated, more talented chefs are entering the market. Chef Jonah Kim, formerly of Michael Mina’s Pabu in Baltimore, has recently announced that he’ll be opening Yona, a ramen shop in Arlington in partnership with Mike Isabella in early 2015. I had the opportunity to take over the kitchen at Isabella’s G as Kim demoed a concept vegetable broth ramen. Vegetable ramen is not something you will likely ever find in Japan, but indicative of the creative licenses chefs have taken with the dish. Kim prepared a vegetable broth mixed with soy milk and topped with fried Brussels sprouts, carrots, pea shoots, fried enoki mushrooms, and a half-boiled egg. Kim constructed the flavor profile to mimic a tonkotsu ramen -- "The soymilk gives the vegetable broth added body and creaminess to mimic a fatty broth" and "the buttery enoki mushrooms act like the chashu or meat component." 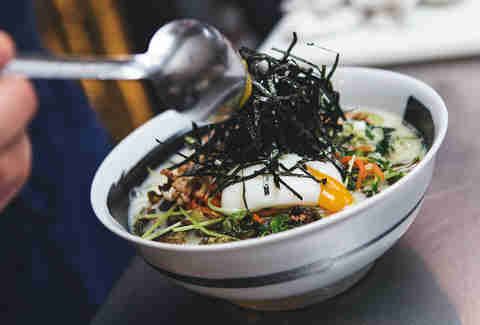 While not a traditional bowl, Kim’s ramen is informed by tradition in the same way that Bruner-Yang’s are, to create a unique dish that’s respectful of its roots but allows for creativity. When Kim’s Yona does open, however, he’ll be doing primarily pork-based broths, but won’t be "super traditional." Kim pays homage to his Korean heritage: "kimchi will be a big part of the restaurant." Kim began workshopping ramen during his time in Pabu’s kitchen -- “that’s where this whole ramen thing started; it gave me an opportunity to try other styles." 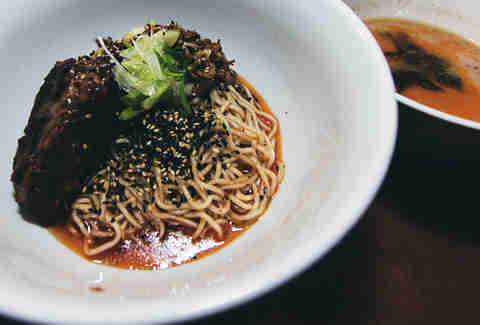 And at places like Mandu’s Anju pop-ups, where he’s served dishes like ramen carbonara and ramen kimchi quesadillas. "Those aren’t things I’ll do at Yona," Kim assures, "but there are different things you can do with ramen noodles that I’m excited to explore." Yona is still months away, but be sure it will bring something interesting to the table when it does. And expect others to follow suit.